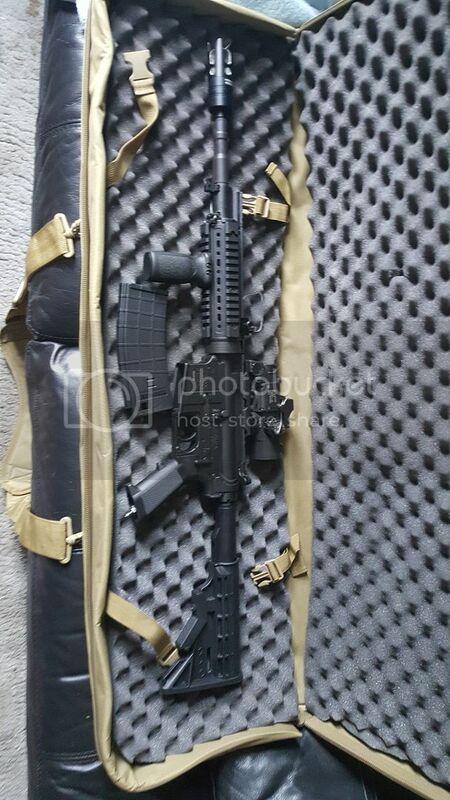 Got my Tippmann M4 couple of weeks ago from Jason at Incentive Designs. It had a few extras put on it from new the incentive designs superbolt plus their new hop unit and a different nozzle and the awesome venom from Incentive Designs it's also running on hpa. I used it for the time at Bush Valley last Sunday and I'm in love. It sounds like no other gun out there the thing is a beast you can actually see foliage falling when it's firing on full auto. Going to get a new rail for it and fit a madbull barrel and Magpal stock but I'm seriously impressed. Give us more, MOAW substance!! Every gun cuts through plants, not nice that you're "I love this gun, it's capacity for violence sates me" as the highlight of your post. Kudos on the sound though. How about telling us what these 'awesome' parts do, anyone can have a shmexy name for a part they make. Apparently this post caused some offence, but that was not intended. I am sorry for that. Did you wake up this morning and think what can I have something to say about today? The superbolt increases the recoil in the gun has a very nice kick to it. The venom acts as an amplifier and also has bright LEDs in it that flash when ever a round is fired simulating muzzle flash looks awesome in low light. Is that ok for you officer? The Venom looked super tacky to me when I saw it demonstrated. What's it like indoors vs. outdoors? I like it suppose it's down to personal preference. I've not actually used it indoors yet. My mate has got one on his and he used it at the Mall I thought it looked cool. Definetly makes the Tippmann sound mean. Everyone was saying they knew I was firing wherever I was could just hear it lol. No I woke up and thought, what's this thread about I CBA to highlight your text and right click search google (well, cba and it didnt work anyway). Same is true to you with your completely useless [OP to this] thread. I probably should have put an emote after my first line in the post above (as I was trying to coax some more from you in jest/comradery), but if you want to be rude about it save your self the trouble and start threads which actually have immediate potential to lead to DISCUSSION. This could have been a status update, part of the incentive designs thread, tacted onto an existing tippmann thread, posted in "what have you bought" but instead you posted spam with little to no information and you are surprised someone asked you to perhaps elaborated on what the hell you're talking about. Not to mention the HPA subforum. Now don't get me wrong i'm sure there is a lot to celebrate in your awesome new toy, but please share with us some substance not just an OMFG it's awsome shitpost. Nice pic. What magnification do you run on the lower sight? Lmao Me being rude I found you're reply rude. I'm not a magazine editor I started a post about a new purchase which is then open for people to ask questions. If you don't like the content hie about jogging the f### on and not reading it. What's you're problem? Got a slight desire to be a keyboard warrior have we or maybe got out of bed the wrong side. Might want to wind you're neck in a bit. I got repeated 404's when I tried to find out what the two incentive designs products you were talking about actually were. They have possibly worst airsoft-related website I've ever seen and autoplaying music to boot. Best to just manually navigate to the page you need. I agree the website needs work but they are awesome to deal with in terms of customer service and aftercare. How does it compare with the GHK M4 you have with regards to performance and build quality? In terms of build quality the ghk wins but only because it comes with a metal rail and not a polymor one and the rear stock is slightly better but I will be changing these anyway. Performance wise the Tippmann wins hands down for me. Don't get me wrong the ghk is a good gun but being gas and with the weather we get over here it can be a nightmare at times. Also the magazines are not cheap at £50 a mag and only hold 38 rounds you put 6 gas mags on you're plate carrier and by mid day you're backs killing you at least mine was. Tippmann takes aeg mags and I've been using mid caps which as everyone knows weigh next to nothing so carrying them is no problem at all. I use to find when I was carrying ghk mags I couldn't wait for the game to end as I was knackered. Now I don't want to go in lol. Also the higher capacity mags have completely changed the enjoyment of the game. With the ghk I couldn't really cover people and if I did I'd soon have to reload and even with 6 mags would soon find yourself out of ammo and gas and carrying a bottle of gas everywhere can be a right pain. I had my tank in my camel back last week but it did start pulling down a bit half way through the day when running so I'll order a small tactical bag for it this week and use that. The range even with the standard barrel which isn't meant to be that good is very good in my opinion I will of course change it for a Madbull barrel soon and the noise it makes is addictive so much so the trigger discipline I did have has gone out the window lol. Look at the WAS Cargo Pack for carrying your tank. With the straps it's the perfect size. Sweet cheers mate will check it out. I've been waiting for a qualified opinion on the Tippmann over the ghk m4. I thought I wanted a ghk and now I find myself even further from certainty. I wish I could make up my mind which of these two to get. The GHK is a good gun mate but the Tippmann is better in my opinion you will just enjoy games more. 38 rounds would probably be alright for milsim but normal skirmish you just can't engage enough to be much use lol. They're not really easy to compare - Tippmann is HPA, so it's in a whole different league as far as I'm concerned. If you're ok with an HPA rig and can afford the cost then the Tippmann will win every time if you want recoil and that instant trigger response that you get with a GBBR. To be honest guys I wouldn't give two fools for the HPA, I would only want to run it co2. Does that modify your views at all? Also I hear lots of beef about the plastic rails, so you just buy a metal kit and swap it out, right? Or am I missing something on that part? Tippmann mags have to vent all the CO2 when you run out of BBs. Go for the GHK if you intend to go with CO2 - it's a far more refined design. Yup I saw that also. You know I really want this gun to steal the thunder, I would love it to be a closer contest. Maybe Tippmann aren't done either, this only v1.0 (pt16) or something. I hope they continue to refine this gun. As you say proffrink I think it has ho be ghk still, for me anyway. What Tippmann done to save cost they saved money by fitting polymer rail and a cheap barrel and stock the parts they know you will change out. I'm going to fit a metal front rail bipod 6.03 barrel and magpal stock. I've not used the co2 went straight to hpa but I know the fps obviously goes down with co2 as it gets low and if you eject the mag before its empty obviously you will lose the remaining gas.